WHY HIM? Charming, cultured and the Founder and CEO of Art de Vivre group—don't let Arthur de Villepin's famous last name fool you, this bachelor has worked hard to make a name for himself in the art world. He's an avid traveller who's always on the go, so you can count on plenty of adventures with this globetrotting beau. CAVEAT: His former girlfriend is French actress Ana Girardot. Tough shoes to fill, indeed! WHY HIM? This tech entrepreneur is sure to keep you on your toes. Aside from co-founding five industry-disrupting startups, being an angel investor and a philanthropist working on Time Auction—an organisation that aims to empower aspiring young entrepreneurs—Aaron Lee has competed in white collar boxing matches, is an avid watch enthusiast and an overall awesome guy. Oh, and did we mention he was one of just a handful of Generation T honourees who attended last year's Breakthrough Prize Ceremony in Silicon Valley? Quiz: Which Hong Kong Bachelor Is Right For You? WHY HIM? If the bevvy of beauties at his recent 40th birthday bash was anything to go by—one could say that Sean is certainly one Hong Kong’s most eligible bachelors. Charming and with a smile that could kill, the founder of Awethentic Studio is an avid photographer and conservationist. So if you’re passionate about saving the planet and enjoy long hikes or days at the beach—often accompanied with his pooch Sparky—then this guy’s for you. WHY HIM? It's never a dull moment with Alex Yeung; this go-getter is the executive director of Emperor Group and was the visionary behind The Pulse in Repulse Bay among other exciting projects. NATURAL HABITAT: When he isn't busy unveiling new ventures, you'll find Alex wake-surfing and mingling with Hong Kong celebrities and socialites. WHY HIM? Does Pearson's name sound familiar? That might be because he made headlines in December when he was named executive director of Dickson Concepts, the owner of department store Harvey Nichols. Pretty impressive for a 24-year-old if you ask us! PERKS: Getting first dibs on the latest in fashion and beauty? Yes, please. WHY HIM? Roni is the youngest child of Shirley Hiranand and just like his glamorous mother, he's a regular on the Hong Kong social scene. He's an associate at VECTR Ventures, which is a global early stage fund and studio based in Hong Kong. Roni frequently travels for work—which could mean plenty of fun weekend trips and adventures. SOFT SPOT: Roni absolutely adores animals. WHY HIM? Masato Kuok is the son of Yumi Honda and is a descendant of Robert Kuok of Kerry Logistics and the Shangri-La Hotel Group. He currently holds a managerial role in one of the family businesses, Kerry Properties and—oh, sorry, lost our train of thought as we were distracted by that dashing smile. PERKS: His mother, Yumi is the CEO of Oasis Spring Holdings, a luxury lifestyle consultancy for resort villa rentals and yacht chartering. Get in her good graces and you could be sailing in luxury while staying at some seriously stunning villas. WHY HIM? The art collector and professional is only 28 but already runs a successful art consultancy, McNamara Art Projects, as well as a new gallery in Wong Chuk Hang. He’s definitely going places. SIGNATURE STYLE: A fedora or panama hat. He collects them and never leaves home without one. WHY HIM? Besides his incredible good looks, you mean? Well, let’s see: Loui is the vice-president of brand strategy, marketing and communications for his family’s company, Dream Cruises, an architect in training and an enthusiastic art lover. Check, check, check. PERKS: Given his family’s business interests, it should come as no surprise that he loves to travel. He's also got a kind heart and genuine interest in helping those in need. WHY HIM? A graduate of MIT, Mario is one of Stanley Ho and businesswoman Angela Leong’s younger sons. He runs his own tech venture out of Shanghai. NATURAL HABITAT: A European football fan, Mario travels around the world to watch games, pose with players and hang out with his siblings. WHY HIM? As creative director of Hong Kong fashion brand Moiselle, the label started by his parents in 1997, Harris has his finger on the fashion pulse. His collections are youthful and opulent, and his shows are awash with his fashion pals including Feiping Chang, Jonathan Cheung and Sabrina Ho. NATURAL HABITAT: His Porsche. Harris can also be found pumping iron in the gym. PERKS: A perfectly toned torso. WHY HIM? The British-educated third son of Burmese property tycoon Serge Pun, Ivan has put Yangon firmly on the map of cool. PERKS: His lifestyle firm, Pun + Projects, runs three restaurants in Yangon and turned a riverfront warehouse into an edgy, year-long pop-up culture hub called TS1. Ivan also knows how to throw a party—check out the hashtag #burmaimpossiblychic on Instagram. WHY HIM? Because you could name your future son James and revel in the glory of having offspring forever mistaken for Ian Fleming’s celebrated protagonist. Oh, and because the Hong Kong-based Bond was a VP at Merrill Lynch and now runs Bond Ventures, a company specialising in private equity investments. PERKS: You’d get to hang out with his intrepid sister Annabelle, who climbed Mount Everest in 2004. CAVEAT: He’s partial to a selfie and likes, nay, loves to party. His signature pout—a suave scowl that might be described as Blue Steel meets Angry Birds—is an acquired taste. 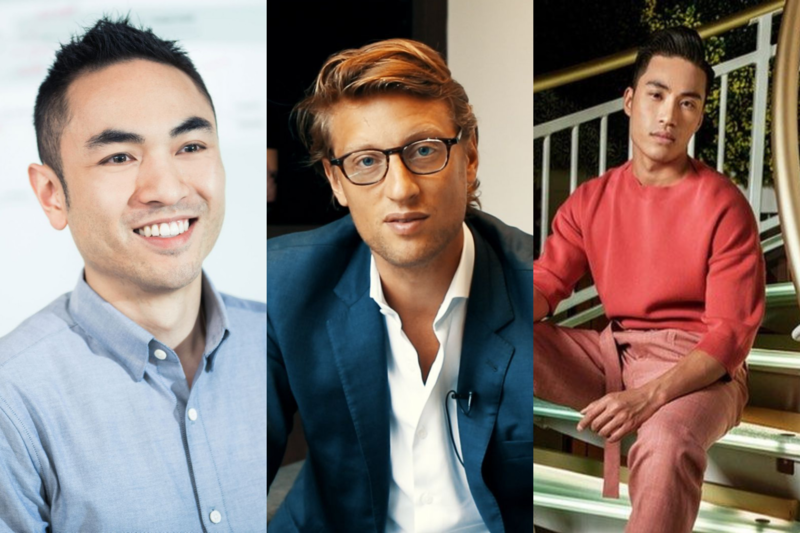 take the Quiz: Which Hong Kong Bachelor Is Right For You? WHY HIM? Always had a thing for John Lennon? Sadly that ship sailed in 1980, but the next best thing is Nick, his doppelganger. Based in Hong Kong, this tall, bespectacled beau is the Director, Asia at Galerie Thaddaeus Ropac. CAVEAT: You'll need to brush up on your art smarts if you want to win his heart. WHY HIM? Notoriously private, famously handsome and extremely sporty, Douglas is the son of Hong Kong property tycoon Peter Woo and his wife Bessie. He succeeded his father as chairman of Wheelock and Co in 2014. WHY HIM? Grandson of the late Bossini founder Law Ting-pong and brother of Queenie Rosita Law—who was named "Most Promising Young Lady" at the Hong Kong Tatler Ball in 2017—clean-cut Kino is making a name for himself as CEO of Hong Kong developer K&K Property. WHY HIM? As managing partner of Buzz Concepts, Jonathan knows a good party when he sees one. Indeed, the party often revolves around him and his fabulously stylish crew. PERKS: Rolling with JC, as he’s known to his pals, you’d be the plus-one of one of Hong Kong’s most invited. CAVEAT: That said, you won’t meet him unless you’re already on that list. WHY HIM? Son of Hong Kong A-listers Ronald and Johanna, 26-year-old Max sports the gentility of a bygone era and the charm of a seasoned Casanova. He currently works in start-ups. WHY HIM? The older brother of Eleanor Lam, Lester oversees Media Asia, the entertainment arm of his father’s property and media empire, meaning he can get the best tickets to any concert. WHY HIM? The grandson of the late Henry, Eric is the second of Timothy’s three sons with Loletta Chu-Lo. Vice-president of the Fok Ying Tung Group, a member of the Guangdong CPPCC and a director of the Hong Kong Football Association, he is a graduate of King’s College London. PERKS: A nautical enthusiast, Eric is keen to foster an interest in yachting in the younger generation.